It’s gift-buying time, for whichever ecclesiastical reason you personally buy your gifts. So here’s a nifty trick question for the daughters/nieces in your life after they’ve opened their presents: how old would Barbie be in real life? The easy answer is that she would be 52, as she was introduced in 1959. But not so! She was introduced as a teenager, of course (let’s say sixteen), so the actual year of her birth would be 1943. And do you know who else was born in 1943, do ya? This guy. Oh, that should be a good one. But if you are shopping for young kids of a certain age, chances are you will be buying a Barbie. 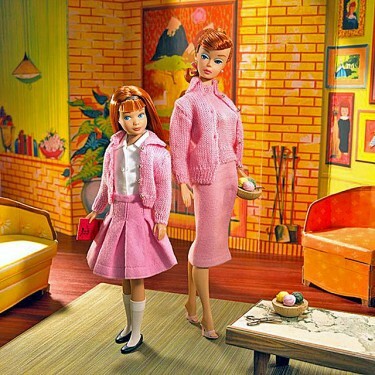 After all, three or four generations have grown up with Barbie as a go-to Christmas present. Surely the passage of time has not affected the base price of the Barbie as it has other things favored by children? I guess we should find out. In case you are one of those Americans who take Barbie for granted, the success story frequently reported as the triumph of the imagination of Barbie’s creators is actually more the success story of the company they founded a decade before they introduced Barbie, Mattel. Mattel’s founders, Ruth and Elliot Handler, started in 1945, working out of a garage workshop. In 1959, they launched Barbie, which Ruth named after her daughter, who inspired the product with her fascination with paper dolls with cut-out outfits. This Barbie was a little more frightening looking than the one you’re used to, heavy on the eyeliner, with a wicked widow’s peak and a permanent sidelong glance. She originally sold for $2.99 (which, converting into 2011 dollars with this handy app, equals $23.26), and she flew the shelves, putting Mattel on the map as a toy industry behemoth (which would go on to produce such iconic toys as Chatty Cathy and Hot Wheels, and eventually acquire Fisher-Price). over a hundred plastic surgeries to look like Ginny or Cissy, at least. Part of the intended appeal of the doll was that she was a clotheshorse, and as such, different outfits could be purchased in which to dress her up. We’re leaving the outfits out for the purposes of price comparison, but we note them for the purposes of gawking, such as this designer pink gown available in 1975 (for $3.99, or $16.79 in 2011 dollars), or this 1965 collection of elegant eveningwear, from prom dresses to mink stoles, starting at $2.43 each (or $17.47 adjusted). 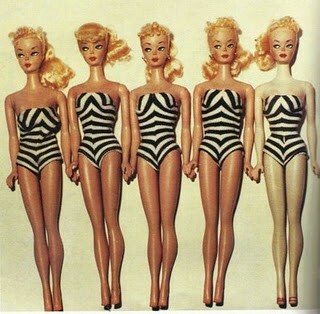 Barbie was not just a heavily accessorized doll; Barbie was a narrative. She was initially introduced as a “shapely teenage fashion model,” but as sales took off, Barbie’s story filled out. By 1961 she had a boyfriend, Ken, and by 1964 she had a little sister, Skipper, selling for $1.91 (or $13.95, in 2011 dollars). As years progressed, the storyline filled out with more characters and a ceaseless array of accessories, like houses and cars, and playsets denoting the activities filling the Barbie lifestyle, recreational and even occupational. Barbie’s age was elastic as well — she could be played out as a late-teen college student, or a fully grown-up TV game show hostess, only $11.99 in 1988 ($22.95 in 2011). Barbie’s enduring appeal is based on the fact that she is, and has been, simultaneously nostalgic and reflective of the current era. Special mention must be made of Barbie’s domicile, which wasn’t just a house but a Dream House. My little sister had one, and I don’t think there were many of her friends who didn’t have one as well. Their cost tended to be on the prohibitive side, but where else was Barbie going to sleep? In the toy chest? In 1992 you could get this one, a modest little three-story with furniture and accessories for $169.99 (or $274.34, adjusted). Mattel kept Barbie changing with the times, toying with Barbies that reflected the current fashion (1969 Mod Fashion Ensembles, retailing from $1.99, or $12.28 adjusted), which was difficult during the Sixties, in light of the turbulence of the era — go-go boots for Barbie and a Nehru collar for Ken might make good fashion, but the potential to be identified with the more divisive aspects of the late Sixties and the Sexual Revolution (e.g., flag-burning, free-loving, etc.) made for a delicate path for Mattel. But in 1971 they hit a home run with Malibu Barbie. Malibu Barbies was not a post-Hippie Barbie, or even a pre-Kent State Barbie, but rather an eternally ageless beach bum Barbie. Mattel sidestepped the issues of reflecting the popular consensus by placing the Barbie in the context of a non-political, leisurely innocence. If you were a child of the ’70s, Malibu Barbies were as ubiquitous as Micronauts. When she rolled out in 1971, she retailed for $1.94, or $10.85 adjusted. This tension is pretty much impossible to dispel in a world so big, especially when issues of commerce are involved, but they did result notably (and amusingly) in the formation of the Barbie Liberation Organization, which, in 1993, switched the voice chips in three hundred Teen Talk Barbies with those from Talkin’ Duke G.I. Joe “action figures.” The Teen Talk Barbies were then under fire, as one of the pre-recorded phrases that the doll would speak was, “Math is hard.” Now, math is hard, of course, but out of a Barbie’s mouth it’s a horizon-limiting moment. Out of G.I. Joe’s mouth? Weary, existential observation. (Teen Talk Barbie, at the time of its release in 1992, retailed for about $25, or $40.35 adjusted) for Christmas. Another unique entry into the Barbie line appeared in 1997 — Share A Smile Becky. Becky is the member of the Barbie universe in a wheelchair. Becky (and her rig) went for $22.99 at the time, or $32.43 adjusted. As a sad accidental bit of verisimilitude, as critics noted at the time, Becky’s wheelchair did not fit through the front door of Barbie’s Dream House. Also it’s uncertain if the intent of labeling Becky as “Share a Smile” was anything but politically correct condescension, though we sure did share a smile when my wife gag-gifted a Becky to her Barbie-mad mother some years ago (more of a share-a-shriek event). There is an aspect of consumption that is aptly raised by this cursory examination of Barbie: the “secondary use market,” or the collectors market. If you take a quick spin around the web, you will see that Barbie is not only a very popular topic, with links popping up to all the retailers, but she is even more popular as a collectible, with a big messy underworld of those who collect Barbies and those who sell things to them. This is not unique to Barbie, of course, if you have ever collected baseball cards or comic books, but it is robust. Eventually Mattel recognized this market and began to manufacture lines of Barbies aimed at the enthusiast as opposed to the child, the Limited Edition line and the Collector’s line, with dolls based on iconic movie stars or characters, or wearing clothes specially designed for the doll by name designers. But if you’re in a rush, and you can navigate the bewildering number of options available (collectors editions of everything from I Love Lucy to Farah Fawcett Poster to Twilight), you can pick up a simple Beach Barbie for $6.99 from Target. Not bad. Or go big and add on the Barbie Dream House from Amazon, for $159.99. Confusing! As you can see, even if you ignore accessories, the prices jump all over the place. True, the lowest price item is the most recent, basic no-frills doll, which, at $6.99, represents a steep drop from the 1959 version. But even as the baseline decreases over time, there is the alternate universe of stuff staring you in the face without which the Barbie experience is incomplete. It’s truly a buyer’s market in the world of Barbie real estate, though the Dream House remains a big-ticket item amongst the items you might find under the Christmas tree. Give credit to Mattel: as Barbies became so overwhelmingly popular and the price of the basic dolls themselves decreased, they found innovative new ways for children to browbeat their parents into doling out massive amounts of money to them. As a one-time child (that reference to Micronauts was not an accident, no, and the Batmans and Green Arrows I played with were called super hero dolls around the house and not action figures), I totally understand, and as an adult of child-rearing age, I’m terrified. 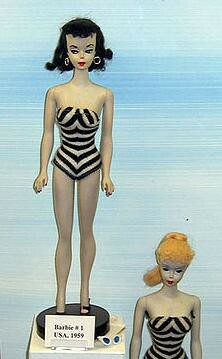 Photo of first edition Barbies by Сергей Бережной, via Wikipedia; image of Barbie and Skipper courtesy of James Vaughan, via Flickr.